Tasks are the actions you need to do. For example, you might set a Task to remind you to call a Contact on a particular date. You can set up Tasks for yourself and assign them to other people in your organisation. To Add a Task, in the Account, click on the ‘+ Add‘ button. There are dropdown options for each field and a date picker. 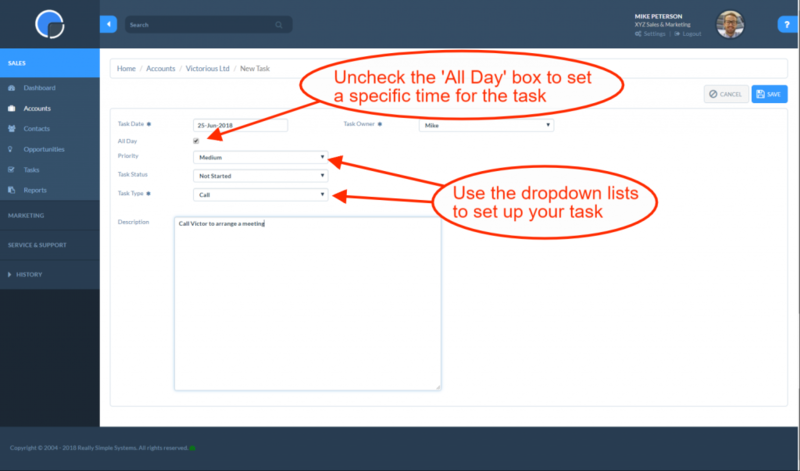 If you want to set a time for your task you can do so by unchecking the “All Day Task” box next to the Task Date and typing in the time in the task date field. You can also set Repeat Tasks so a task repeats at a given interval, e.g. every month or year (see below). You can change the dropdown options to suit your business needs by creating custom settings in the Dropdown Lists. Once saved, the Task will be added to the Company Account record. On your CRM Sales Dashboard you can select a widget that will alert you to any outstanding Tasks. You can also access your Tasks list from the main menu. You can filter the Tasks by My Tasks, My Groups’ Tasks and All Tasks. When you complete a task in the CRM system, as well as just Saving, you also have the option to use the ‘Complete and New’ button on the top right corner. ‘Complete and New’ completes the task and then automatically takes you to the ‘Add Task’ page to setup up a new task for the Company Account. For example, you can finish a task to call a client but want to set up a new task straight away to call back a week later to set up a meeting. 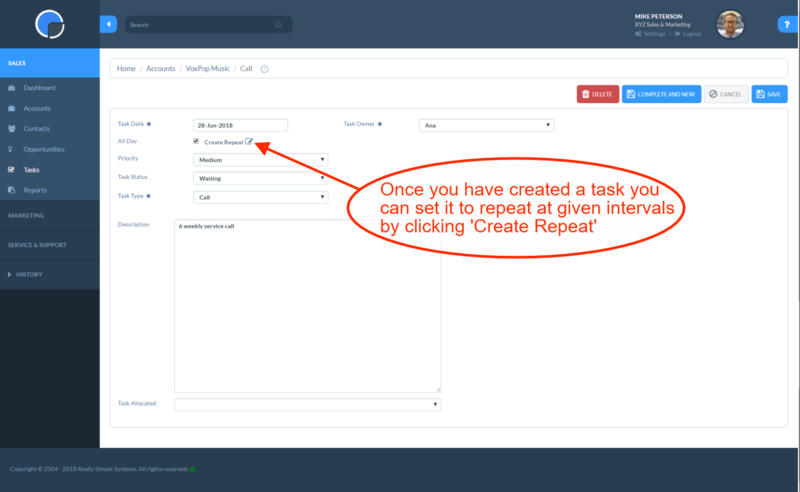 Repeat Tasks lets you create a task that repeats at given intervals. For example, you might want to set a task to flag up an annual expiry date or maybe for a 6-weekly courtesy call. Once you have created and saved a Task, a new option will appear for ‘Repeat Tasks’ under the task date field. Clicking this will open a new window where you can select the repeat option. The repeat can be set to end on a specific date or to continue indefinitely if no End Date is set. When you set a Task for someone else you can select whether or not to send the Task Owner an email reminder. N.B. The reminder is sent when you set the Task. Please contact us to switch on this function.